How do you read execution plans? From right to left, left to right, or by checking out costs? Or what about objects like index scans, table scans, and lookups? This blog discusses how to read a Microsoft® SQL Server execution plan. Although SQL Server usually generates a good plan, sometimes it's not smart enough to validate its plans and fix the poor ones. You can get an estimated execution plan and an actual graphical execution plan in SQL Server. Generate these plans by using the command ctrl M or ctrl L or by using the icons, which are placed to the right of the execute icon on the standard tool bar of SQL Server Management Studio (SSMS). SQL Server has other types of plans, but those plans are not covered in this post. Estimated execution plan: Estimated plans provide an estimation of the work that SQL server is expected to perform to get the data. Actual execution plan: Actual execution plans are generated after the Transact-SQL queries or the batches are executed. Because of this, an actual execution plan contains runtime information, such as the actual resource usage metrics and any runtime warnings. Have you ever noticed the difference between the estimated plan and the actual plan for the same query? Most of the time it will be the same, but it might be different because of statistics changes, schema-related changes, or changes in the data. You should always check the actual execution plan when troubleshooting. If you have many objects, you need a better way to get an overview of the amount of data processed by each operation. Download the SentryOne Plan Explorer and view the plan using this tool for an easy way to get an overview. After you download and configure SentryOne on your system, open the execution plan with it. SentryOne has many views and descriptions, which you can use as you need. To get the data processing view, change the view by selecting the Data size in MB option as shown in the following image. Your goal is to find an opportunity to reduce the overall data processing. The logical reads 5 result shows that SQL Server reads 40 KB (5 * 8 KB) pages to get the data from memory. When optimizing the query, do not ignore logical reads because this could be physical as well as logical on live servers. You never know if the pages to which you are referring are on memory or on disk. The target should be to reduce the number of cumulative read operations. After the actual plan is generated, hover your mouse over any of operation or logical units in the execution plan. 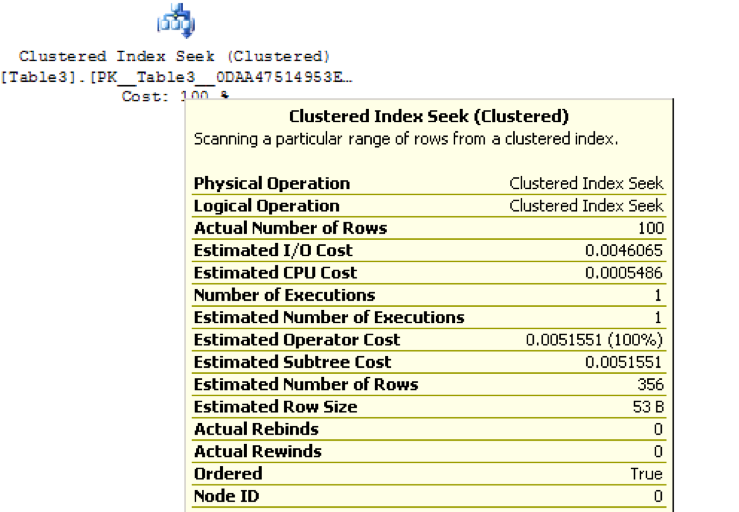 Refer to the following image to see the type of physical operations, like the Clustered Index Seek or Scan results. Look for the number of executions and the actual and estimated number of rows. Avoid looking at the cost of individual operations because that is an estimate in seconds based on old hardware and may not provide accurate details. 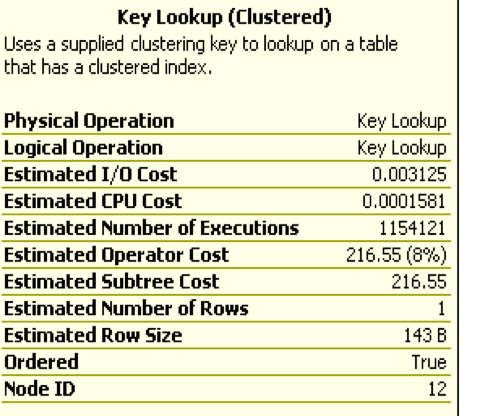 In the following image, the Clustered Index Seek operator executed one time to get 100 records, and SQL estimates 356 records. The difference could be due to outdated statistics or query performance. The following image shows the estimated number of executions is 1154121 times on a cluster index to get one record. That is significant. Even though the operator cost is lower, and we could have simply ignored it, looking instead at the other operations with higher costs, this might have proved to be a costly choice. Such operations have a high impact on query performance despite having a cluster index. Row ID (RID) lookups are a similar operation for the heap. The difference between the estimated and actual number of records is another thing that you should be considering. 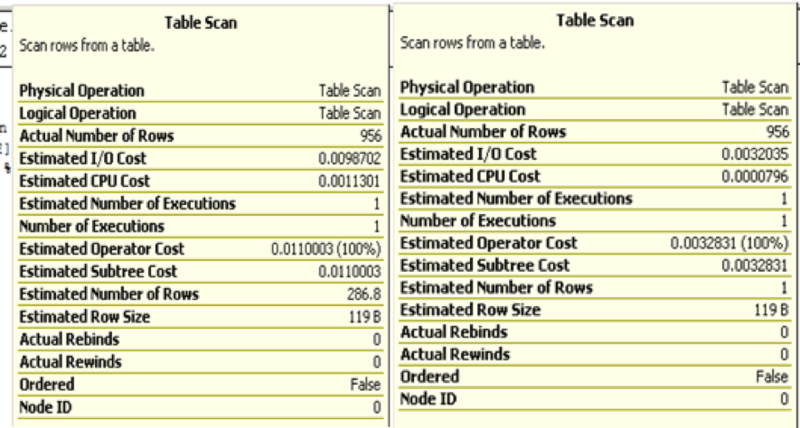 A wrong estimate might result in a query having limited memory allocated. When that happens, it uses a temporary database (tempdb) to get things done. The wrong choice of an operator or plan by SQL Server might result in slow operations and extractions of the queries, as shown in the following image. The actual number of records are same, but the estimates are different. This could be due to outdated or missing statistics. Note that the table variables have no statistics, so the plan always returns 1 and 1K in new releases until the option to recompile is used. Thus, table variables are not a good choice for a large number of records. You need to consider the impact of sorting. The sort operator is used mostly for the following functions: aggregate, merge join, or order by clause. This might not have an impact with just a few records, but, with each additional record, processing slows. Try to avoid sorting or don't use the order by clause. If sorting is required, use the application grid to do the sort instead of sending sorted data to an application. With spool, it is important to notice the number of rebinds and rewinds. Rewind is costlier than rebind. For example, in the following image, the operator shows 2674 rewinds, which implies that the query is re-executed 2674 times to get the data. It returns each operator from table spool to table scan to get each record in rewinds. Rebind means it got the data from spool and didn’t return for the table scan. Because they perform well on small record sets, hash and nested loops are the next operators you should consider. However, for large record sets, or when there is a large difference between the estimated and actual plans, these operators can create a huge impact because they might use tempdb instead of memory. SQL Server posts the following warning in operator details: “operator used tempdb to spill data during executions”. If this happens, pay attention to the statistics. With a wrong estimate, the loop falls short on memory allocation or it keeps iterating. Look at the allocated memory for the execution. To view memory allocation, open the property box by selecting the start point of the execution plan (left-to-right). If nothing is abnormal, then query tuning should be the ideal choice. Your first target for optimizing a query should be to reduce overall reads and writes (that is, I/O on disk). Don’t forget logical reads for reads and writes in memory. Reducing the I/O solves most of the problem and queries run much faster. Next, look at other operations that are expensive due to activity on tempdb. Remember, tempdb is used for many operations and is always expensive. Look for rewinds - the number of executions of any operation, spools, sorting, and loops. These are expensive when used with tempdb. Don’t forget to review warnings on each operator because those provide good clues. Even though this post doesn't discuss the missing index operator, that doesn’t mean you can ignore it. Review it, but don’t create the index blindly. Check the other indexes available on the same columns, and consider the impact on queries running in your database. If you have any questions on this topic, comment in the field below.